Dozens of old washing machines. Hundreds of defunct flat-screen TVs. And more rusty refrigerators than she can count. Liz May has seen her share of electronic waste over the years — and she’s doing her part to make sure it is properly disposed of and recycled. “When you see that you’re making a difference, you know things are moving in the right direction,” she said. 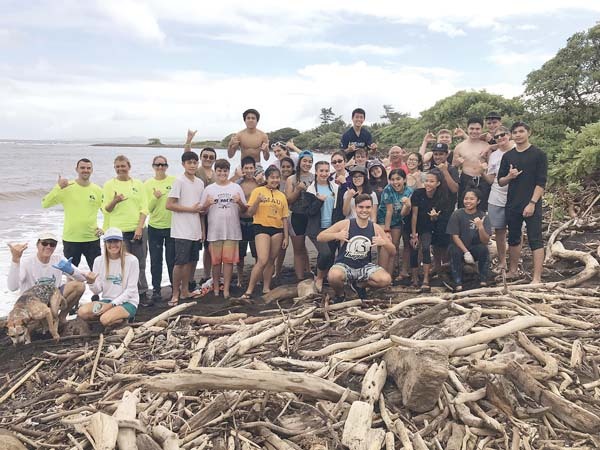 May is a volunteer for Malama Maui Nui, a 501(c)(3) nonprofit organization — formerly known as the Community Work Day program — that empowers residents to work together to keep Maui County clean, safe and healthy. May moved to Maui in 2009 to manage 5A Rent-A-Space in Lahaina. It wasn’t long before she became acutely aware of a distressing trend: the illegal dumping of household appliances and other waste in West Maui’s ditches and alongside roadways. “Someone had to do something,” she said. So, in 2013, under May’s direction, 5A Rent-A-Space hosted a free electronic recycling event. It was an auspicious debut: A steady stream of residents turned out to drop off items ranging from air conditioners to computers to water heaters — and everything in between. At the end of the day, May says it was clear to everyone that there was a need for more e-cycling opportunities in West Maui. The following year, May became the co-president of the newly minted Rotary Club of Lahaina Sunset. As they mapped out goals for their new club, the Rotarians unanimously agreed that recycling would be a top priority. Soon after, the club joined forces with Malama Maui Nui to organize a monthly recycling event at Lahaina Cannery Mall (the program is supported by the County of Maui and 5A Rent-A-Space). Since the summer of 2015, May and her fellow Rotarians have gathered in the mall’s parking lot bright and early every third Saturday of the month. There, they roll up their sleeves and accept electronic waste on a first-come, first-served basis, and at no charge (there are no redemption fees for any items). To say the “Go Green Recycle Third Saturday” event has been well-received would be an understatement: May says there’s always a line of people waiting to drop off items first thing in the morning. The monthly event has made a considerable impact; it has reduced the amount of waste sent to the landfill and has likely curbed illegal dumping. And you can help, too. On Saturday, Feb. 2, Malama Maui Nui will host its first annual fundraiser, “The Hukilau: Pulling Together for Maui’s Resources”î from 6 to 9 p.m. at the Maui Ocean Center in Maalaea. It’s an aptly named event: A “hukilau” (“huki” means “to pull” and “lau” means “leaf”) is a centuries-old Hawaiian fishing tradition. Community members would gather to cast a large fishing net and work as one to pull it back to shore; all who helped shared the bounty. The all-ages, family-friendly fundraiser will benefit Malama Maui Nui’s existing and forthcoming projects, as well as education and action-oriented programs that promote environmental stewardship through hands-on learning opportunities for youths and adults. Malama Maui Nui and the Rotary Club of Lahaina Sunset will host the monthly “Go Green Recycle Third Saturday” e-cycling event Saturday from 9 a.m. to noon in the Lahaina Cannery Mall parking lot. For more information, to inquire about volunteer or donor opportunities or for a list of accepted (and unaccepted) items, call Malama Maui Nui at 877-2524 or 5A Rent-A-Space at 669-5200. To learn more about volunteer opportunities with Malama Maui Nui, visit www.malamamauinui.org/volunteer. Tickets for the inaugural Hukilau fundraiser are still available for $150 per person. Tickets include dinner, cocktails and evening access to all Maui Ocean Center exhibits. To purchase, visit www.malamamauinui.org. To inquire about event sponsorship and silent auction donor opportunities, call 877-2524. * Sarah Ruppenthal is a Maui-based writer. Do you have an interesting neighbor? Tell us about them at missrup penthal@gmail.com. Neighbors and “The State of Aloha,” written by Ben Lowenthal, alternate Fridays. What’s changed one year since the start of our recycling crisis?